Pheenix was Martin's first 100% machine-coded video game. It is a classic arcade-style shoot-em up. The game consists of 5 stages, and includes an awesome battle to destroy the alien mothership in stage 5. Destroy formations of multi-coloured robot birds, only to reach swarms of evil blue and pink flapping birds hatching from cosmic eggs. Avoid their deadly plasma shells, using your pulsating laser-barrier and rapid-fire photon cannon, to reach the final stage of your mission - to break through the giant mothership's defences and destroy the enemy's leader. 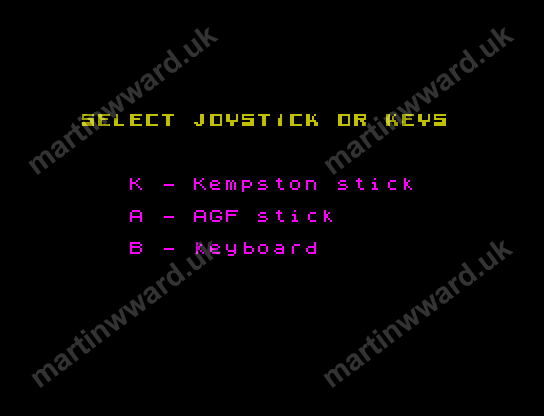 At the start of the game, the player chooses whether to play with a joystick or use the keyboard. There are also 5 difficulty levels to choose from. The difficulty level corresponds to the speed of the game. Level 1 is for beginners, whilst at level 5, the game runs at break-neck speed. The game starts with 5 lives. 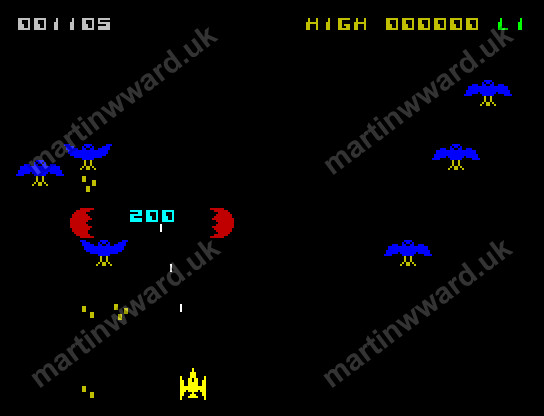 In stage 1, the player is faced with a wave of alien mechanoid birds that sweep into battle formation before beginning their bombing attack. The player must avoid the bombs and destroy the attacking aliens. 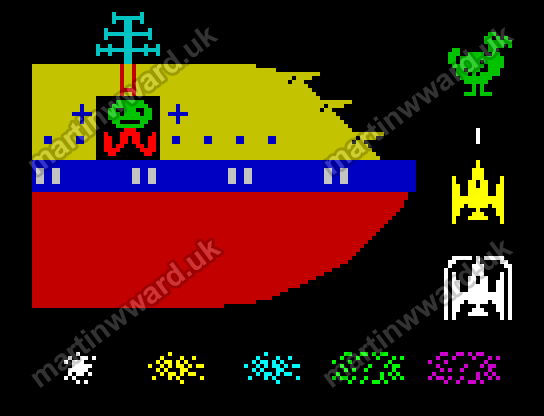 The player's ship is armed with a single-pulse laser cannon, and an alien-proof barrier, that can be activated for short periods in tight scrapes. The stage ends when the player has eliminated all of the attacking aliens. 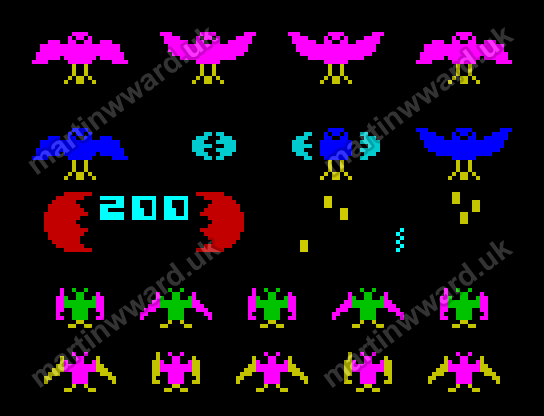 In stage 2, the player faces a second wave of mechanoid birds. This time green birds in a different battle formation. In stage 3, the player's laser cannon is upgraded with rapid-fire capability. The stage begins with formations of strange bird eggs sweeping across the screen from the left and from the right. These eggs gradually hatch into giant blue birds. The birds can only be destroyed by direct hits. Hitting the birds' wings causes them to squeal, but is otherwise harmless. 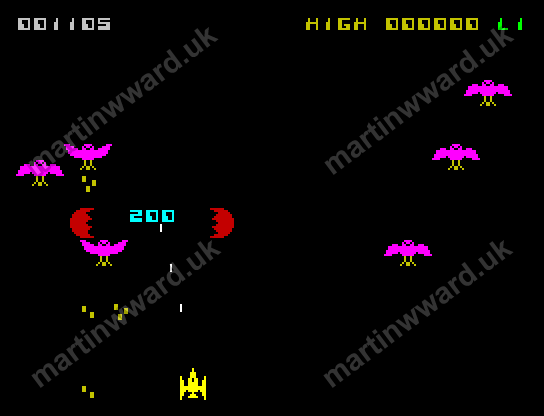 In stage 4, the player faces more giant birds, this time pink ones. Once the player has eliminated all of the giant pink birds in stage 4, the player progresses to stage 5 - the ultimate stage. This stage includes the awesome alien bird mothership. 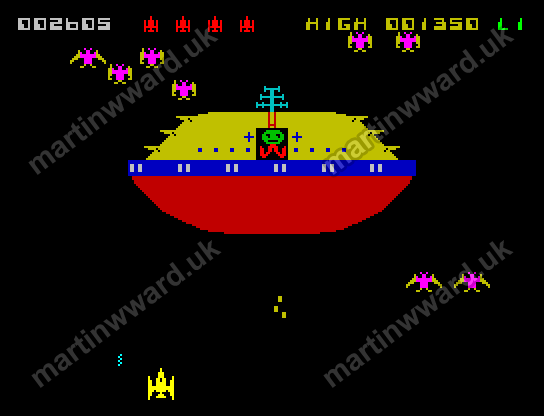 Whilst under constant attack from a vanguard of mechanoid birds, the player must shoot away at the mothership's massive red shield, until a gap can be created in the rotating blue disc. 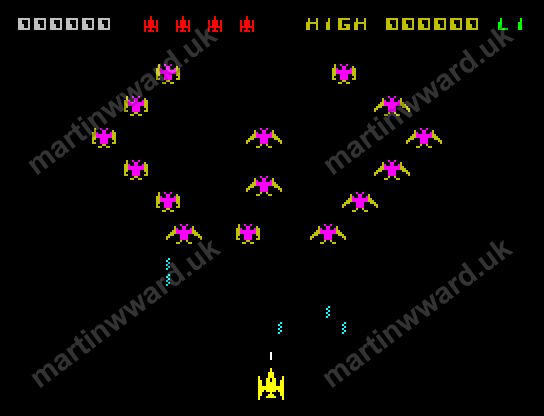 Only then can the player's laser pulses reach the mothership's alien commander. Destroying the commander ends the level, and the player is awarded 5000 bonus points. If any lives remain after stage 5, the player is taken back to stage 1 and the game continues, but with the difficulty ramped up a level. Pheenix was developed using a Z80 Assembler called EDITAS. The development process was entirely cassette-based. Source code was written in 3 sections, only one of which could be present at a time in the Spectrum's 48 kiB RAM. Each section was assembled and the resulting Z80 code sections were saved to cassette. The 3 code sections could then be loaded together and saved to produce a final single complete code section. This was about 8 kilobytes in length. A single complete build would take more than 20 minutes. 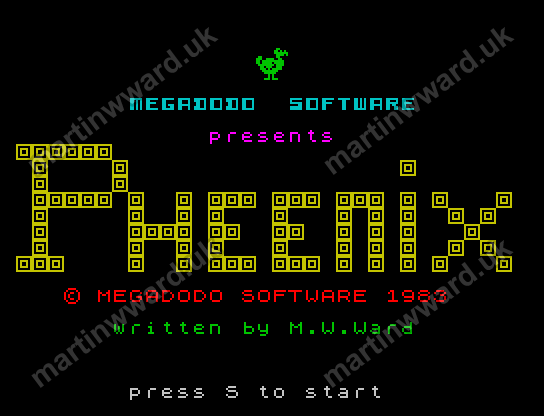 Pheenix was launched in July 1983, under Martin's Megadodo Software label. It earned some excellent reviews in the computer game press. The best Spectrum "Phoenix" yet! Pheenix is 99% accurate as a copy of the arcade original, and includes 5 screens with 5 skill levels. The entry skill level can be chosen by the player (level 1 is slowish, level 5 is very, very fast). A demo mode will run if the keyboard is left alone for a short time. There are no instructions on playing the game, so watch this demo very carefully. 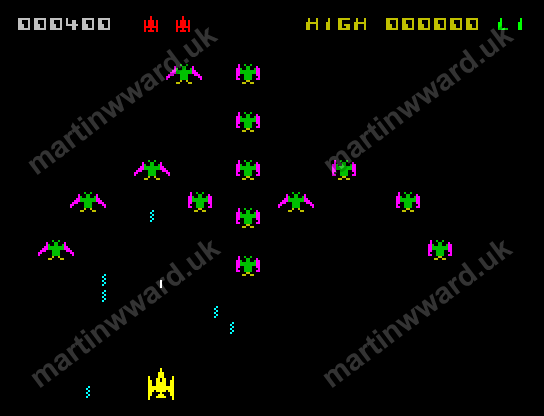 Once the various options have been chosen the game begins with a tuneful melody - just like the arcade original; even the scrolling stars have not been forgotten. In screen 1 (your craft appears at the bottom of course) very colourful birds form up on the screen, one or two breaking formation to attack you. For defence a laser cannon is supplied and an electro force field comes as standard. Screen 2 is very much like the first but the birds are a different colour (flapping wings as well) and they attack you more frequently, but you can shoot more quickly now. On screen 3 you will get a surprise when you start to shoot the weaving eggs - they split open with the points awarded inside, the two halves of the egg shooting off to either side of the screen just as in the original. After three passes of the eggs over the screen, the birds inside hatch out, flapping creatures, each with a mind of its own. Now the force field comes into its own, saving you from the deadly bombs and their kamikaze attacks. One thing though, the barrier can only be active for a certain length of time before it needs recharging. These birds certainly don’t like you, and will sacrifice their lives for yours if necessary. Screen 4 is a copy of the third screen except for the colour difference. There are the eggs again, but the resulting birds are even more lethal for it. On both this screen and screen 3, giving a bird an indirect hit causes it to yelp - great!! Screen 5, and on to the Mothership. The object is to shoot away the protection barrier beneath the ship and kill the mother bird inside. Of course, she isn’t going to let you get away with this, so she throws loads of cluster bombs at you. The Mothership is also protected by highly dangerous birds, which not only swoop at you, dropping as many as twelve bombs at a time but they’ll also kamikaze you if the bombs don’t kill you off. Screen 5 is very difficult to complete, but if you do, then a tuneful and visual display congratulates you and you return to screen 1 with the game speeded up. All the details of the original have been included and I was very impressed with the way the birds flapped their wings and with the explosions. The sound appears to have been faithfully reproduced, and the Spectrum has been pushed a long way with this game - and what’s so appealing is that it has all been fitted into 16K. If you haven’t got it, definitely a game to add to your collection. As was the norm in 1983, sales were initially mostly by mail order. Later, Martin negotiated contracts for distribution, including with W H Smith, R & R, and Callisto. Sales expanded internationally when Martin negotiated licence deals for the production of localised versions of Pheenix in Spain (with Ventamatic), and in Sweden (with RIKO Data). 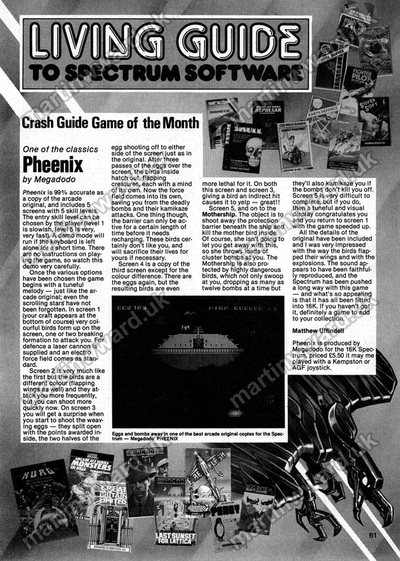 In 1986, Pheenix became the first game to launch under the Alternative Software budget label. 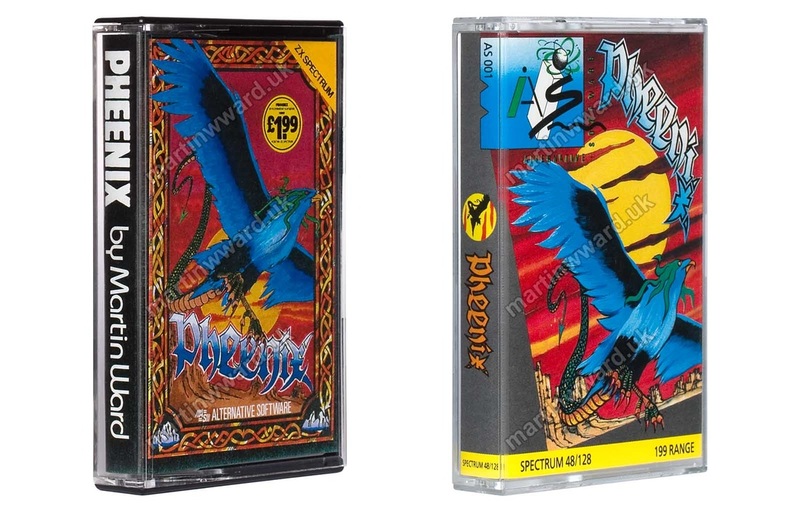 In 2002, long after the ZX Spectrum ceased to be a mainstream games platform, Pheenix was given an unexpected new lease of life when it featured prominently in marketing material for the newly launched Amstrad e-Mailer Plus. The Amstrad e-Mailer Plus had the ability to download and play ZX Spectrum games on its monochrome LCD screen.